In recent years, interest and concern regarding biodiversity conservation have grown remarkably not only among conservationists but also amongst a wider public beyond scientific institutions. The monitoring of fauna and flora over long periods of time has been satisfactorily proven to be a viable tool for quantifying how environmental changes affect natural communities. Some bat species are regarded as good bioindicators, mainly due to their longevity and high sensitivity to environmental changes. Myotis daubentonii is one of the species most closely associated with riparian habitats in the north-east Iberian Peninsula, and is used as an ecological indicator in specific monitoring programs such as the Waterway Survey (United Kingdom) and the QuiroRius (Spain). Nonetheless, there is still great controversy as to whether M. daubentonii is a good biological indicator or not. 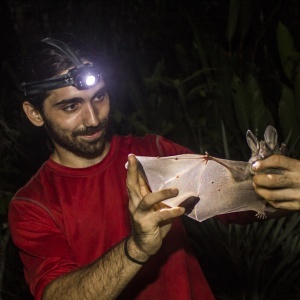 While some authors accept it as a bioindicator, others point to the studies carried out in the U.K., Poland, Switzerland and Germany that show a remarkable increase in the numbers of this bat when pollution increases in canalized rivers, which suggest that it is in fact a generalist species. Due to the lack of information regarding habitat-quality requirements in Daubenton’s bats in the Mediterranean region and the species’ potential as a bioindicator in riparian habitats, we aimed to 1) examine how QuiroRius data match other well-established biological indicators (IBMWP for invertebrates and QBR for riparian forests); 2) analyse how environmental variables at both local and landscape scales affect the presence of M. daubentonii; and 3) describe how environmental traits influence the relative abundance of M. daubentonii. A total of 104 streams below 1000 m a.s.l. were simultaneously sampled using bat, macroinvertebrate and vegetation bioindicators. Despite having similar conservation aims, these three bioindicators did not provide consistent images of overall ecosystem quality and thus a multidisciplinary approach is necessary for a full analysis of the health of these riparian ecosystems. M. daubentonii were found more frequently in wide rivers with well-structured native riparian forests; on the other hand, landscape composition at broader scales and altitude had no influence on bat presence/abundance. Thus, we suggest that QuiroRius could be used as a complementary bioindicator for analysing riparian forest quality but cannot be used alone as a tool for evaluating correctly overall riparian ecosystem health. Both relative abundance and/or presence/absence could be used as bioindicator surrogates given that the effect of microhabitat environmental predictors had similar impact on both these measures.